I came across S.J. Bolton through Amazon Vine when I was offered Dead Scared which blew me away, I love the protagonist Lacey Flint and S.J. Bolton’s writing is plot driven and authentic. This is one of those author’s I’m so pleased I found and her books always make it to my wishlist. S.J. Bolton has produced another fascinating book featuring Lacey Flint, the third in the series. In this book Lacey is not working after her ordeal in Cambridge acting undercover in the prestigious university instead she is on the peripheral to the on-going investigation into the missing boys; all aged 10 to 11 who are found near the Thames with blood drained from their bodies. Her old boss Mark Joesbury is involved in the investigation as is her previous mentor Dana Tulloch. As well as the police investigation a young boy, Barney, who lives next to Lacey is interested in the crimes, reading the Facebook updates and discussing the details with his school friends. Barney is really at the heart of this story, his voice authentic and his fears real, keen on blading, football,and sneaking away from his busy father to hang out with his friends, he is sure that another boy will go missing and he is eager to stop that happening. With the police monitoring social websites too, and a maverick academic ruling the news, this story is firmly placed in today’s world. I found myself mesmerised by the story, the twists and turns were all too alarming, the landscape too well described and the thoughts of a young boy very disturbing but totally believable. I wouldn’t recommend reading this book until you have read the previous two in the series, the amazing Now You See Me and the equally engrossing Dead Scared and just like these, this is a dark read, not simply a police procedural and S.J. Bolton pulls the style off to perfection. This is the first outing by S. J. Bolton’s of Lacey Flint and it is amazing. A serial murderer is on the loose in London and the crimes may be linked to Jack the Ripper. Lacey returns to her car one night and finds a body against her car, straight away it is clear that this book is not for the squeamish. Given the the killer’s apparent interest in Lacey she is moved from a witness to one who ends up working closely with Mark Joesbury on the case. Lacey is strong, determined and clearly has not had an easy life, there is the undeniable tension between her and Joesbury which remains just that, no endless soliloquies on longing for him but as the reader I want to know how the relationship will develop. This book really does have it all, the atmospheric descriptions of London, plausible and gripping writing, the feeling that something even more awful than you have just read is about to happen and a particularly likable, yet believable, character in our protagonist Lacey Flint. A perfect mystery story which I found defeated my reasoning with its twists and turns. I had already read so can recommend the second book Dead Scared and I the third, Like This, For Ever is due April 2013 and on my wishlist in anticipation. Having read Now You See Me and Dead Scared the wrong way round I initially thought that this book followed Dead Scared due to the fact it was set in December 2012. This was wrong, it should be read after Now You See Me. This is a perfect short story with a huge amount happening in a matter of 85 pages. It is rare for me to read a short story without feeling in some way cheated, SJ Bolton however produces the goods. In the park near Lacey Flint’s house a muslim doctor is set alight. Lacey appears to be the only witness to the incident but couldn’t identify those responsible due to the masks they wore. 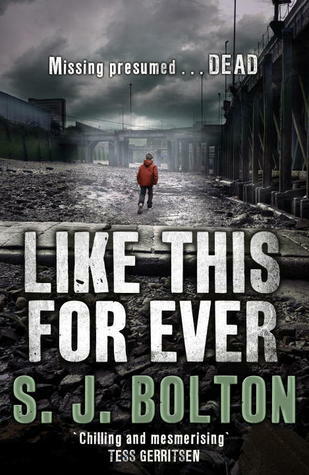 This is a shocking story yet SJ Bolton still manages to layer the tale to give it real depth and some twists and turns in this short perfect tale. S. J. Bolton tackles the controversial subject of suicide in her fifth book, Dead Scared. Within Cambridge University psychiatrist Evi Oliver is worried as the number of suicides amongst the students has spiked over the last 5 years and she suspects websites and chat rooms are behind the rise. DI Mark Joesbury puts forward DC Lacey Flint to go undercover as a student to see if she can discover what, if anything, is going on. Lacey moves into a room previously inhabited by a girl who attempted suicide in a particularly grusome and public way. Within hours Lacey is subjected to a particularly nasty prank and deviates from being an observer to an investigator. This book is well written, I loved the interplay that Lacey and Joesbury have which started in S.J. Bolton’s previous offering, Now You See Me, where the characters were introduced. In fact the only thing that marred my enjoyment of this book was that I hadn’t read the prequal, something I plan to rectify soon. The tension slowly increases throughout the book when it seems like Lacey may have come close to the truth, be warned though there is more than a smattering of red-herrings throughout which kept me guessing. This is a belivable and well written police procedural combined with a strong psychological thriller which results in a winning formula.